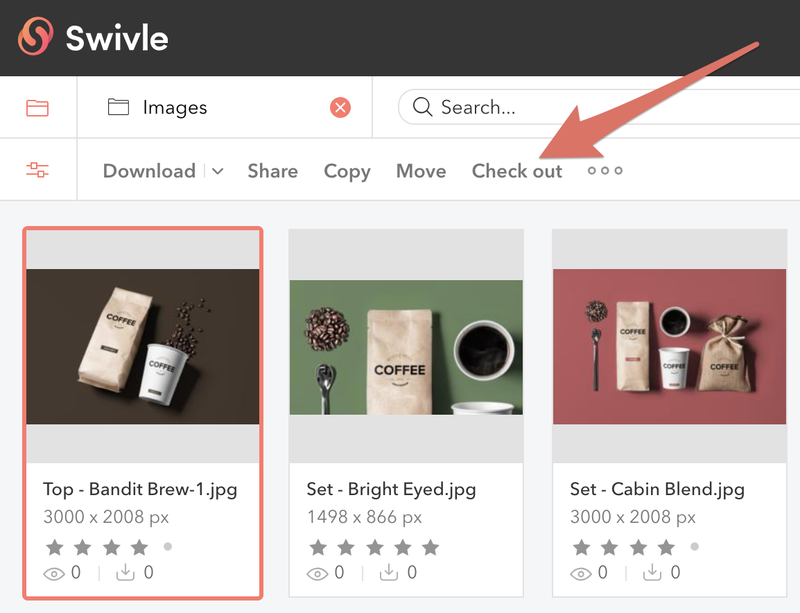 This article describes in detail how to work with Swivle Agent to check out, edit and check in your files. In this article you will find the details of how you can work on your files when you have installed and configured the Swivle Agent. A more basic and limited way of working with your files, that doesn't require any additional tools is explained in 'The Classic Check-out / Check-in workflow'. Our 2 minute video is a great introduction to the Swivle Agent! As a quick overview of what is described in this article, the following are the main actions for opening a file, editing it in some way and saving it back to Swivle. Within Swivle, locate the file that you want to edit. Select it and in the menu bar choose Check out. The file is now opened in its native application. Edit the file in some way and save it. 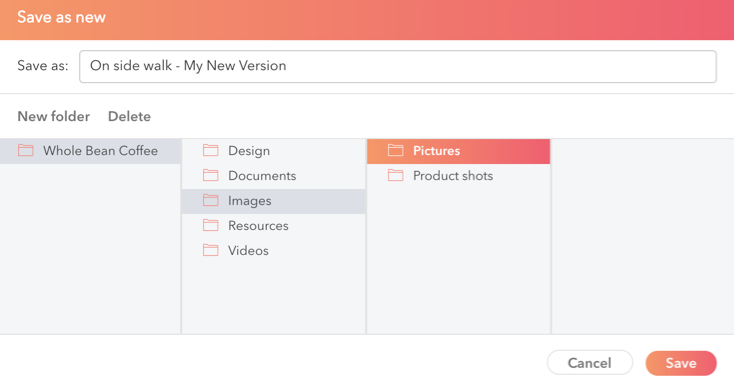 Access the Checked-out files page in the Swivle and select the file that you want to save back to Swivle. Click Check in to update the original file with the edited file. Click Replace to replace the original file with another file. This can be the same file but with a different name or file type, or a completely different file. For full details about this process, see the rest of this article. Swivle shows an agent status icon next to the 'Checked-out files' button in the top of the screen. When a connection is made, lost or re-established, a notification is shown next to the icon. Tip: If a connection is not automatically restored, click the icon to manually trigger a connection attempt. Select one or more files that you want to check out. Click Check out in the menu bar or use the "E" keyboard shortcut. Right-click a file and choose Check out from the context menu. The file is checked-out and automatically opened in its default application. Files that have been checked-out can be managed from the Checked-out files page. It can be accessed by clicking 'Checked-out files' at the top of the page. Figure: The Checked-out Files page. 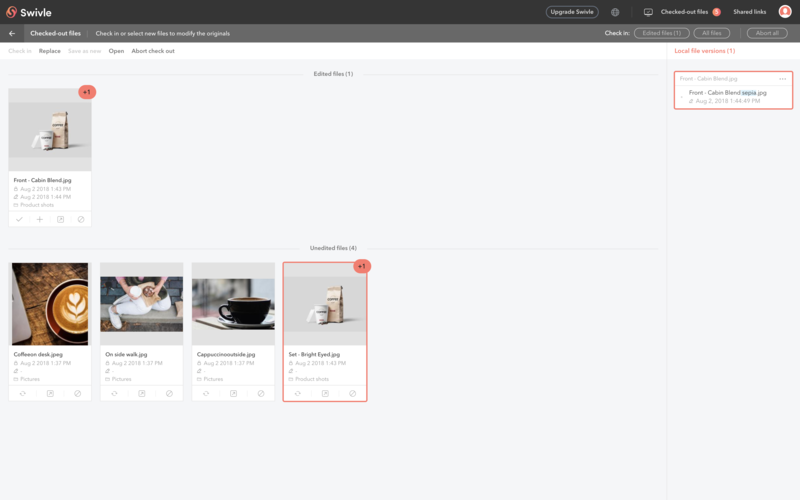 Each type is displayed in a different section on the page (see figure above). When a file has been checked-out, it will initially appear as an 'unedited file'. This indicates that no changes have been made to this original file. When the file is edited and saved using the original file type and file name, it appears as an 'edited file'. Example: A file named flower.jpg is edited and saved as flower.jpg. When a file is edited and saved using a different file type or file name, it is seen as a version that is related to the file that was originally checked out. Example: A file named flower.jpg is edited and saved as flower.png. These files appear in the 'Related files' panel on the right side of the page. The number of related files is indicated in a badge at the top of the thumbnail. Selecting the thumbnail will also select the list of files that are related to the file in the Related files panel. The part of the file name that is different is highlighted in blue. 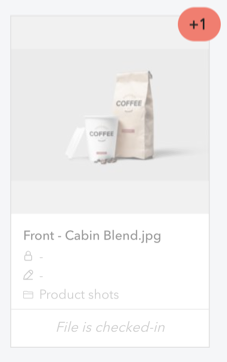 For example: The picture below describes a file that 'Front - Cabin Blend.jpg' that has been checked out and edited locally. The file has then been saved as 'Front - Cabin Blend sepia.jpg'. Therefore, the ' sepia' part is highlighted. Check in is only available for a file that is edited and saved using the original file type and file name (in other words: files that appear in the 'Edited files' section). Replace is available for all files and allows you to replace the originally checked-out file by a different file. This will typically be a different version of the same file but can potentially be a completely different file. Checking-in a file can be done when the edited file is saved using the original file name and file type. Select the file and from the menu bar, choose 'Check in'. Right-click the file and from the context menu, choose 'Check in'. On the thumbnail of the file, click the 'Check in' icon. In the toolbar, click 'Check in: Edited files' or 'Check in: All files'. The file is automatically checked in. The file is unlocked: other users can now check-out the file. The file that was downloaded onto your system is removed. Tip: When Swivle Agent is running but the Pro client shows that it is not connected, click the Swivle Agent icon in the Pro client to try and re-establish the connection. As long as there is no connection between the Pro client and Swivle Agent, the Replace option needs to be used (see below). It is very common to open a file and to save it under a different name or as a different file type, and then to use that file to replace the original file with. Select a single file and from the menu bar, choose 'Replace'. Right-click a single file and from the context menu, choose 'Replace'. In the Related files panel, hover the mouse pointer over the thumbnail and click the 'Replace' icon. Step 2. Browse to the file that you want to replace the original file with and double-click it or select Open. If a related file still exists for the original file, then that related file is shown dimmed in the place where the original file was shown. It will show the text 'File is checked-in' in the thumbnail. If needed, it can still be used to replace the original file with. Remove it from the page by deleting the file from the Related files panel or by clicking 'Abort all' from the toolbar. After opening a file and editing it, instead of using the edited file to replace the original file with, the edited file can also be saved to Swivle as a new file. On the Checked out files page, select a file in the Edited files section. From the menu bar, choose 'Save as new'. Right-click the file and from the context menu, choose 'Save as new'. The 'Save as new' window appears, showing the location in the Folder browser where the original file is stored. 3. Browse to the folder where you want to save the file and click Save. The new file is added to Swivle. The original file is unlocked: other users can now check-out the file. The original file is removed from the Checked-out files page. The original file that was downloaded onto your system is removed. Select the file and from the menu bar, choose 'Abort check out'. Right-click the file and from the context menu, choose 'Abort check out'. On the thumbnail of the file, click the 'Abort check out' icon. Select the file and from the menu bar, choose Abort check out'. In the toolbar, click 'Abort all'.